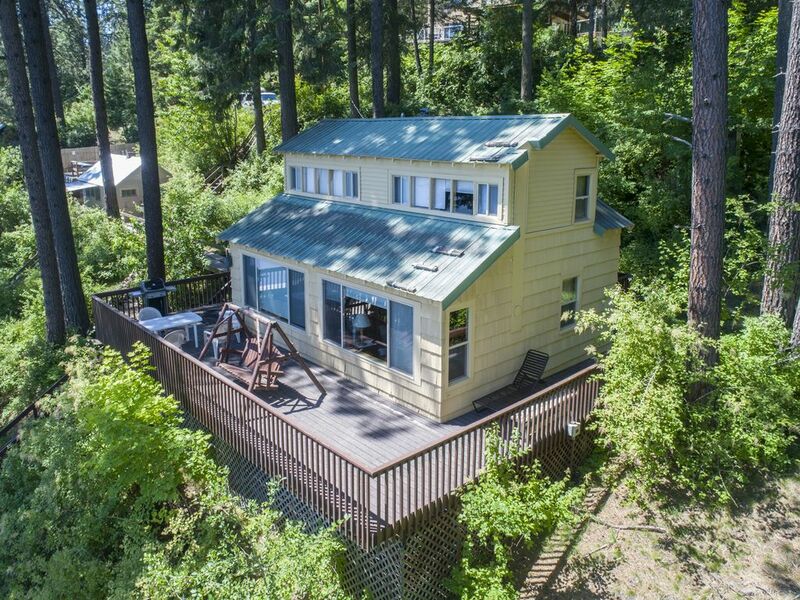 225' lakefront on Hayden Lake, 45' deck, water trampoline, non-smokers, no pets. 2 BR, 1 BA, sleeps maximum 5, non-smoking, no pets. Open May to September. PLEASE READ THOROUGHLY MY DESCRIPTION & HOUSE RULES BEFORE BOOKING! Overlooking the beauty and serenity of Hayden Lake is this modern, fully furnished vacation rental. Located on the west side of the lake, towards the north end, this cabin comes complete with satellite TV, with 42' flat screen, DVD player, and internet. Also decks, gas barbecue grill , washer and dryer, fully-equipped kitchen, and clean drinking water from our private well. The 225 feet lake frontage includes a private dock with two boat slips, water trampoline's, 20 ft Woosh mat and second swim dock. A 45 foot deck near the water for your relaxation. A splendid waterfall near the lake offers extra elegance to the setting. This is a Non-Smoking property. 'I only rent to Non-Smokers.' No Pets allowed. No overnight guests. Maximum number of renters , including adults and children, is 5. NO EXCEPTIONS. Walk across the bridge to the beige cottage which is a game room. A foosball table, board games, elliptical machine, puzzles, and books all inside for your entertainment. Next to the game room is a fireplace for roasting hot dogs and marshmallows and a barbecue table!. We have other condos and cabins available. All new furniture spring 2016. Double futon with an 8 inch thick mattress. Rocker/recliner. Comfy chair. End tables. Entertainment center with TV, DVD player, satellite and DVD collection. new cabinets, corian sink and counter tops, dishwasher, disposal, built in microwave over range. NEWLY REMODELED KITCHEN - new cabinets, corian sink and counter tops, dishwasher, disposal, built in microwave over glasstop range, new lighting and new flooring. 1 TV in living room. fooseball table, puzzles, and board games. Also has an elliptical machine. There is a firplace and a BBQ table by the gameroom. New horseshoe pit. 10 X 30 deck attached to the home with large porch swing, gas grill and patio furniture. Additional 45 ft 2 tier deck with chairs and lounges. water trampoline, woosh mat is 5x20ft. Allows you to lay in the middle of the water like an air mattress and is anchored to the bottom of the lake. Great for small kids and adults. My family stayed here for a week in August. We had such a great time. The house is small but cozy. The view of the lake is a great way to start the day. Boat launch was easy to access. Karla was always available and helpful. This property was wonderful for our family of four! The kids had a great time swimming. Everyone was friendly. The cabin had everything we needed to have a great week in northern Idaho! My family and I stayed at this little gem this month. Tucked away from the hustle and bustle of life, it was a perfect get away. Beautiful view of the lake from the kitchen, living room, and all bedrooms. Newly redone kitchen is stocked with everything you need. Just steps down take you to a boat dock. You share this dock with another family who may be staying in the other house on this property. Our family had a wonderful time and Karla was very easy to work with. She answered all questions and even gave us a homemade jar of jam when we arrived! We will be back! We had an amazing experience at the Lakeside Loft. We got to experience lake living for a week. The lake is stunning, all the decks for the views, the outdoor fire pit, all made for an amazing week with the family. Karla was so great to work with. We would definitely recommend this property. This is a beautiful rustic cabin on a quieter part of the lake. We really enjoyed our stay. The kids liked fishing off the dock and playing with the toys. It was perfect for our boys ages, 13, 10, and 7. We loved the location and the cabin was very comfortable. This rental shares the dock with 2 other rentals. This wasn't a problem during our stay, but we were not aware of this ahead of time. We would love to visit again. I enjoyed having the Bormes family here. The children are well behaved and enjoyed the water trampolines and game room. My property is over one acre and has 225 feet of waterfront while other lots in this area only have 50 feet. So having three families share is not a problem. Most families spend two days at silverwood theme park, triple play, bike riding, or hiking. Kids always enjoy the chance to make new friends and seem to play together well. I look forward to having the Bormes family return to the property. Great week at Hayden Lake! Our week at Hayden Lake exceeded expectations. The Lakeside loft was cute, cozy, comfy, clean, and close to the lake. Perfect cabin for 5 people. View was wonderful. Dock was great, and room for us to park our boat, and another family to park their boat. Water trampoline, and slippery slide were fun. Water was warm and waterskiing was fabulous. Easy parking for one car. Karla was easy to work with. Only caution would be if you have trouble with steps. Lots of steps to get down to the cabin and to the dock. The sun deck was wonderful. The games were fun (horse shoes and shuffleboard). Can't wait to go back! Enjoyed having Doug and Laura here. Very lovely people and will be glad to see them when they return for another visit next week.